In 2012 I had the pleasure of photographing a wedding at Tides Chapel in Mount Pleasant,Sc, for my past clients. This wedding was full of great people, and has it happened the bride lived in Hawaii, and spoke french like I did, we made an instant bond. On the day of her wedding, when I arrived at the hotel, I noticed that there were lots of junior bridesmaids witch was fantastic, as a father with two amazing daughters, I love seeing children being incorporated at a wedding. This little ones asked a bunch of questions, and they all had such pretty dresses, on their hair the wore beautiful flowers, and the best part was that the bride promised them a really nice present if they behaved threw the ceremony. 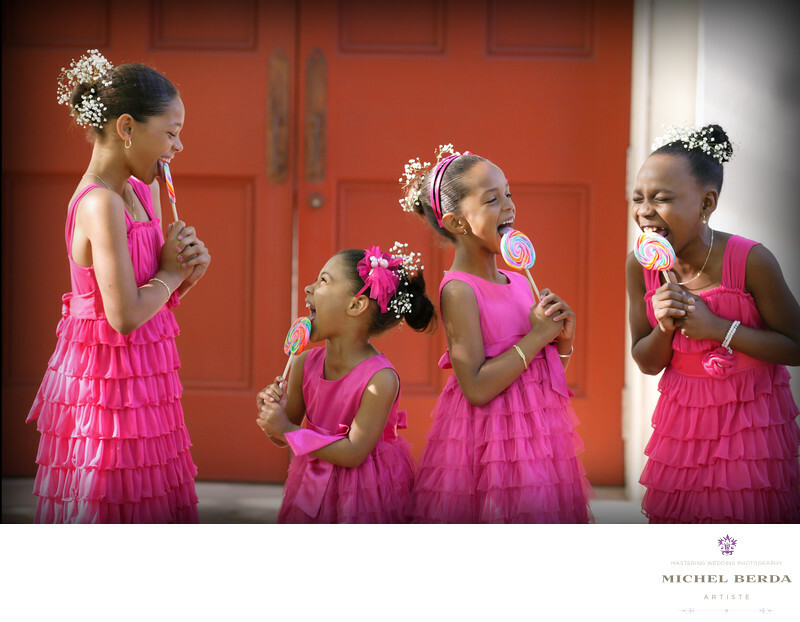 Soon after the ceremony was over, the little girls asked for their present, knowing as a wedding photographer in Charleston, Sc, that this moment and gif was going to be very special the bride gave them a huge surprised, huge large swirl Lollipops. The minute their eyes saw this giant lollipops, it was pure joy and they love and dove right into them. Fortunately for me, I just happened to be ready with my cameras and captured this amazing image with all them, witch made this image that much more precious because as you see the image, your heart speaks children, and the joy they posses.Keywords: Children Wedding Photography (3).